A number of those who practiced magic collected their books and burned them publicly; when the value of these books was calculated, it was found to come to fifty thousand silver coins. Back when I was in high school and college there was a crazy period of time when there was no shortage of scandals centering around a group of prominent American televangelists. 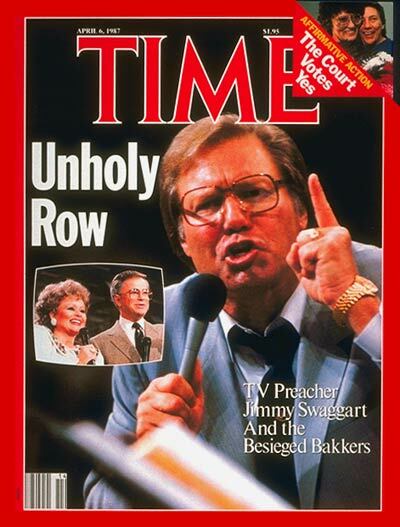 Jim and Tammy Faye Bakker were the couple that the media couldn’t seem to get enough of, but there was also Jimmy Swaggart and others who leveraged their television ministries into personal profit machines and media empires. A closer inspection of these ministry moguls produced plenty of odd and salacious fodder for the tabloids. Many televangelists fell in a strange train wreck of disgrace that was too compelling to look away. I was reminded of the uncomfortable tension between faith and commerce this morning as I read today’s chapter. There were two groups of people described who stood in stark contrast to one another. I had never really noticed this in my previous journeys through the Book of Acts. First, there are those who had vocationally practiced different types of exorcism, magic, and spiritism who became followers of Jesus (v. 18-20). Upon their choice to place their faith in and follow Jesus they abandoned their spiritually dark professions and burned down their old lives. This, of course, meant that would have to begin new lives and careers. This is a picture of Jesus’ consistent admonishment for people to repent (literally, to about face and go the opposite direction) and follow. Old things pass away, new things come. There is a spiritual rebirth evidenced by their willingness to experience a huge financial loss and, in faith, walk away from that which was spiritually dark to begin a new path following the Light. Next, there is Demetrius and the guild of silversmiths tied to the temple of Artemis. The Temple of Artemis in Ephesus was one of the seven wonders of the ancient world and Artemis of Ephesus was a popular fertility idol, her long body covered in breasts (or perhaps their bull testicles, scholars aren’t quite sure). Not unlike the media empires of the televangelists, the Temple of Artemis was a tourist attraction and a lucrative, religious cash cow. With the trending of Jesus, His message, and His followers the business of Artemis idols, trinkets, and souvenirs was taking a huge financial hit. The local metal workers union was not happy. The response of Demetrius and his fellow merchants was to create a public riot and threaten bodily harm to the followers of Jesus along with their forcible expulsion from Ephesus. I consider one group has a spiritual transformation that results in a willingness to suffer financial and vocational loss. Then I think of the other group who are hardened to preserve their finances and vocation at all costs. Finally, I think about the disgraced televangelists from my youth. I’m not sitting in judgment of them, rather I ponder if spiritually I’m not more like them than I’d care to admit. I wonder if they didn’t start out with sincere hearts that were hardened over time by their lucrative, religious cash cows and personal empires. Today, I am doing some soul searching. Which example in today’s chapter am I more like, and what is the condition of my heart? Am I willing to suffer temporal loss for eternal gain, or will I cling tightly to that which is temporal at the sacrifice of my soul?